People familiar with clear aligners from Invisalign are probably aware of how effectively they can realign crooked teeth. 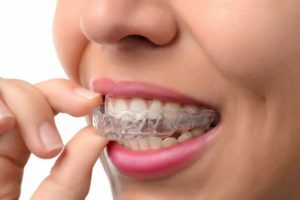 A straighter smile is widely seen as more attractive to most, and as a result many people are asking their dentist about Invisalign in Lynnfield. However, it’s important to also acknowledge that straight teeth offer long-term benefits that are not only cosmetic, but better for oral and overall health in general. Today, we’ll be discussing those benefits and explaining how clear aligners from Invisalign fix crooked teeth so well. Pretty soon, you’ll understand the benefits of a healthier bite and how it relates to improved overall health. When it comes to oral hygiene, crooked teeth and straight teeth couldn’t be more different. When teeth are straight, brushing and flossing are much easier because all your teeth share a single, flat, uniform surface. This makes basic brushing techniques easier to implement. When teeth are crooked, it becomes more difficult to reach all these areas because they’re growing in different directions. Removing food and plaque from these additional cracks and crevices is simply a burden for patients. Additionally, people with straight teeth are less likely to experience symptoms associated with TMJ (temporomandibular joint) disorder, a condition associated with malocclusion (also known as a bad bite.) Teeth that aren’t spaced properly cause problems with the way you chew and bite. This results in additional stress on the TMJ which causes symptoms like headaches, ear aches, and uneven tooth wear. Your dentist in Lynnfield understands the link between oral bacteria and more serious diseases. Heart disease and stroke have both been linked to poor oral health because of the method in which oral bacteria travels to other parts of the body. For example, if oral bacteria can travel through infected gum tissue, it can reach the bloodstream and travel to areas of the body that weren’t previously reachable. Patients who have crooked teeth tend to have more difficulty keeping their mouth clean. But if their teeth are straight, they can more easily brush and floss all the surfaces necessary to reduce their chance of gum disease and therefore more serious diseases. Furthermore, having a straighter smile can do wonders for your confidence, especially if you’re already self-conscious about your smile. Being more confident can help you manage stress and anxiety more effectively than if you weren’t. Invisalign: How Does It Straighten Teeth? Fixing crooked teeth is not a very complex procedure, according to your cosmetic dentist in Lynnfield. Once the clear aligners are produced, you simply need to wear them for 20 to 22 hours a day for maximum results. This is thanks to the small amount of pressure they apply to your teeth over time. Since the clear aligners are made of a special thermoplastic, they can easily be custom-made to fit each stage of your alignment process. This helps your dentist make adjustments as needed to ensure your orthodontic treatment is right on track. Want to learn more about the benefits of Invisalign in Lynnfield? Schedule an appointment with your dentist today! Dr. Rob Schumacher earned his dental education from the University of Kentucky and the University of Michigan. Today, he’s a dentist with over 14 years of experience of providing high-quality dental treatments, such as Invisalign. His background in prosthodontics also makes cosmetic and restorative dentistry much easier. To learn more about Invisalign treatment and his practice, contact him at (781) 334-3400 or visit his website.